Back in January, Google began testing integration of its Google Now personal assistant service with its Chrome browser for the desktop. The feature, which allows users to receive notifications for such topics as weather, traffic, and events and can tap into device location, first appeared in the experimental Chrome Canary builds and gradually worked its way through Chrome's testing phases, and Google today has announced that it is beginning to officially go live for all users. Starting today and rolling out over the next few weeks, Google Now notifications will be available to Chrome users on their desktop or laptop computers. To enable this feature, simply sign in to Chrome with the same Google Account you’re using for Google Now on Android or iOS. 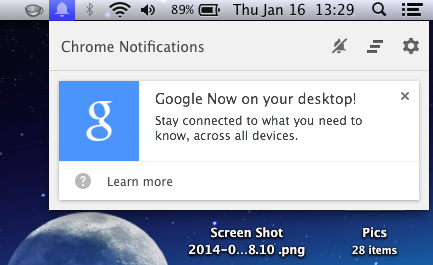 Additional information on setting up Google Now for Chrome is available in Google's help pages. Incoming "Google is evil and are spying on us" comments. Hey, just because you're paranoid doesn't mean they're not out to get you. Also, Google IS evil and spying on us. Oh god, anti-aliasing the text please. One more foot in the door to spy on us later. Somehow I expect advertisements to start showing up on users desktops. Come on Apple, where's Siri for Macintosh?? search for 'Enable Rich Notifications' and Disable it. It's not obvious, well I didn't think it was. On Chrome: I loved Chrome. Unfortunately I had to switch back to Safari since Google still hasn't updated Chrome to 64-bit. Tell me more about this 64-bit-requiring workflow.